Favorite Line: At last it might have been a pane of glass with frost upon it, and as I watched, the frost began to melt and thin. Then I knew that what I could make out, faintly, beyond the ice, were the crisping lines and the deepening colors of my own future. In a new twist for me, I am going to try to post my own plot summaries instead of using the Amazon ones, and I'm also going to get rid of my ratings on this blog. I am removing the ratings because I think they can be misleading. I don't know if I can justify my reasons for giving a book a 10 over a 9, or a 5 vs. a 3, except to point to a gut feeling, which no one but me can really know. This doesn't sit well with me, when there are other people reading this who may or may not take my rating as a sign of whether they might enjoy a book or not. So, I will remove the ratings and focus only on my reactions, which I hope will give everyone a better sense of my thoughts on a book than a number might. As for the plot summaries- I admit that I generally copy and paste the Amazon ones because it's easier. I don't like summarizing plot points, I like to just talk about my reactions to the book. And for some reason, summarizing a plot is harder for me than just generally reacting to a book. So, in a spirit of masochism, I think it would be good for me to try to do plot summaries myself. Here goes! In 1875, Margaret Prior is a plain Victorian woman approaching the age of 30, highly intelligent and sensitive and unmarried. Her father, with whom she shared many scholarly traits, passed away a few years ago and since then, Margaret has felt lonely and isolated. She has also been recovering from an "illness." Margaret begins, as a form of charity work, to visit the female inmates of Millbank Prison. There, as if by fate, she meets Selina Dawes. Selina, in great Victorian tradition, is a spiritualist- a medium through which people can speak with loved ones who have passed away. She is in prison because her last client had a very bad reaction during a session with Selina, and so Selina was charged with fraud and assault. The plot evolves around Margaret's growing fascination with Selina and the increasing sense of isolation from her family that parallels it. The story is told in diary entries- from Margaret's point of view, written in 1875, and from Selina's point of view, written in the years prior to her imprisonment. Both these threads come together towards the end, but not completely- there are still many aspects of the story that are unexplained. But such is the nature of a Gothic thriller, no? Many thanks to Nymeth for prompting me to read this book (really, everyone's suggestions for India reading were absolutely fantastic- thanks so much)! It is the first book I've read by Sarah Waters, but now I will certainly be trying to get the rest of them (and, if I recall correctly, there is a new one out just recently). Waters writes very atmospherically, much like Carlos Ruiz-Zafon. Victorian London seems to seep through the blood in her fingers and turn to ink upon her page. It truly feels as though you are in the period- from the polluted fog to the dreary Thames, from the gaslights to the cobblestones, from the Gothic architecture to the spiritualism craze. She also makes it painfully clear just how difficult and binding it was to be a woman in the Victorian era, especially an unmarried one. Granted, many novels set in the Victorian era make this clear, some better than others. But perhaps it's because Affinity is written as a diary, and so we can truly see how stifled and imprisoned Margaret feels, though she is a wealthy gentlewoman. She spends her days yearning after her brother's wife, and her evenings reading with her catty and quarrelsome mother. In today's world, she would be a professor of art history, I think; in Victorian England, she was only referred to as a spinster. There are times when she can see exactly what her life will be like, for the rest of her days, bickering with her mother until they both grow old and sour, and these glimpses terrify her. It is understandable, in that light, why she so relates to the inmates at Millbank prison- she herself lives in a gilded cage. It is also understandable, painfully so, why she is so fascinated by and drawn to Selina, who is the first person that seems to take a real interest in her (not her health, not her marriage possibilities) since Margaret's father passed away. Waters writes Margaret's character very deftly; readers settle comfortably into her mind and her heart. But it became tiring to spend so much time with someone that emotional. Margaret literally puts her heart on her page, and it becomes very painful to see as the plot evolves and readers get glimpses into what will inevitably happen, and can do nothing to help Margaret. So it is almost a relief to get to the Selina pages of the story, which are much shorter, less emotional and far more cryptic. But those chapters end abruptly. As a reader, I appreciated the author leaving some things to speculation. As a logical person, I screamed in frustration at the plot points left unexplained. The plot is tight and interesting, which I think helps relieve some of the depressing weight of Margaret's situation. Her life is so very bleak that one could almost weep, and so a gripping and intriguing plot help to alleviate the strain of reading that for so many pages. Waters also just writes in such a descriptive and wonderful way- the passages are so evocative. It is almost like that scene in Mary Poppins where everyone jumps into the sidewalk chalk drawing. I look forward to reading more by her- starting with Fingersmith, which is waiting on my shelf. I really want to read this! I plan to read Fingersmith in October. I got your email and will reply tonight or tomorrow! Congrats on the new job if I am slow, though! Great review. This one is on my TBR shelf. I loved Fingersmith. I really want to read this book - thanks for the review. Ironically, I just switched to writing my own plot summaries as well! It's more time consuming but I think it's worth it! Ok. So I HAVE to pick up one of her books. Everyone says how wonderful they are. Oh...and I love your blog header!!! Beautiful! I'm so glad you enjoyed it! And Fingersmith is even better, you'll see! I agree with pretty much everything you said - she captured the confinement of Victorian women so well. Oooh, so glad you liked this one. 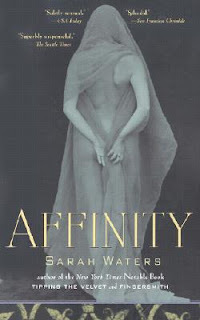 Sarah Waters is one of my favorite authors, and Affinity is one of my favorite books by her - bested only by Fingersmith which is my ultimate favorite and I see you're reading that next. I also loved The Little Stranger as well, and that runs a close third to Affinity, followed by Tipping the Velvet and then my least favorite (but still very good) is The Night Watch. I am glad you liked this one! I really love Waters and think you will really be astounded at Fingersmith. It's one of my favorite books, and she does something amazing with the plot in terms of suspense. It really is a great book, and I am hoping that you will get a chance to read it soon. Great review on this one! By the way, I have to agree with you about plot summaries. I write my own, and find them by far the most difficult thing about the reviewing process. I think you did a great job with this one, and hopefully it comes easier for you as you get used to it.